That response speaks to me of the perversity of “normal” exchange between human beings. People can’t help but give, and receive, beyond necessity, reason and a sense of utility — and the rules of gift exchange operate outside the norms of utilitarian economics. We give (and receive) in spite of our calculative selves. Do we give to feel good? Utilitarians objectify the concept of “feeling good” about one’s altruistic acts, such as giving gifts. For the utilitarian, the payoff for altruistic behaviour is not only the ability to survive better, or improve chances of reciprocation in kind in the future, but also to increase happiness. For the 19th century social reformer, Jeremy Bentham, the principle of utility means that we should approve of actions that augment “the happiness of the party whose interest is in question” (65). The giving of gifts can engender good feelings, and this is an individual matter, society being just the sum of individuals and the social benefit being a sum of the benefits to individuals — the greatest happiness for the greatest number of people. Romantics share this Enlightenment preoccupation with happiness. Romantic subjectivism elevates feeling, emotion, and sentiment. For card-carrying Romantic, John Ruskin, the archetype of self sacrifice resided in the soldier, who must face danger. He lives a reckless life, an excess of pleasure and adventure, and is prepared to be slain on behalf of others. The gift also finds a ready home in the Romantic age: as a spontaneous and exuberant expression of generosity, inevitably linked to emotion and self sacrifice. We in the 21st century media saturated age inherit this sentimentalisation of war, and the gift. Social media and personalised outpourings of familial sentiment have some role in this. Romanticism also lays claim to the role of the creator, who is predisposed to self sacrifice for the sake of art. Creativity takes on the trappings of the gift. For the romantics, the giving and receiving of gifts defies calculation and arises from genius welling up from within, the innate genius of the artist, or is planted from without, a “holy gift to men” from the Muses. Jacques Godbout, in his book The World of the Gift, makes the connection with the Muses. He shows that the generosity of the gift often extends to attributing the gift to another source, as in such dubious benefactors as Father Christmas, the tooth fairy or the gift of the secret Valentine’s day admirer. For the Romantic sensibility the gift of the Muse conceals the creative prowess of the creative individual — behind a kind of false modesty. Godbout also makes clear the supplemental character of the artist’s worth: “An artist is hired for a concert and we must pay to attend. The bond between artist and spectator is, it would seem, entirely quantified. But neither one is satisfied. Both want more than an objectified relationship. The artist wants to be applauded, the spectator wants to applaud; both want to establish a tie that is non-quantifiable, disinterested, that cannot be absorbed by the market” (165). Cultural theorist Lewis Hyde also asserts that “a work of art can survive without the market, but where there is no gift there is no art” (xi). As gift there is no expectation that creativity is given and rewarded in equal measure. Its reward is other than reciprocal. Designers commonly complain of an imbalance in this regard, that clients will more willingly pay a building surveyor or accountant for a routine service in measurement or calculation than they will pay an architect for producing a sketch design. Would-be commercial web site designers seem equally prone to the expectation that their services will be offered as a gift, perhaps pending approval prior to a full commission. Creative output seems to be caught up with expectations of approval, and design presents merely as a forerunner to a calculative exercise. Like the conditions of the gift, designing presents as open ended, in duration, in its interpretation and its valuation. The point at which a client or patron may be obliged to pay the account is uncertain. That design celebrates its qualities in the gift, designers and clients alike tend to regard the production and presentation of a design as a gift, outside of the normal realms of obligation and contract. Linus Torvalds, the inventor of Linux, states (and overstates) the case for why a computer program is not just “intellectual property” but comparable to art: “It’s not property to be sold like chattel, it’s the act of creation, it’s the greatest thing any human can ever do. It’s Art, with a capital A. It’s the Mona Lisa, but its also the end result of a long night of programming, and it’s an end result that you as a programmer are damned proud of. It’s something so precious that selling it isn’t even possible: It’s indelibly a part of who you are” (205). These sentiments also take us close to the myth of the designer as misunderstood hero, prone to working without adequate appreciation or reward, suffering the indifference of aesthetic ignorance from patrons, clients and users, the criticism of the tasteless public, the constraints of bureaucracy and soulless economics. Of course, the calculative tradition has sought to bring design into the orbit of the measurable and the remunerable, though against the resistance of the romantic impulse that prefers creativity and design to be otherwise, however hard it is to turn it into a living. This post is derived from Coyne, Richard. 2005. Cornucopia Limited: Design and Dissent on the Internet. Cambridge, Massachusetts: MIT Press. 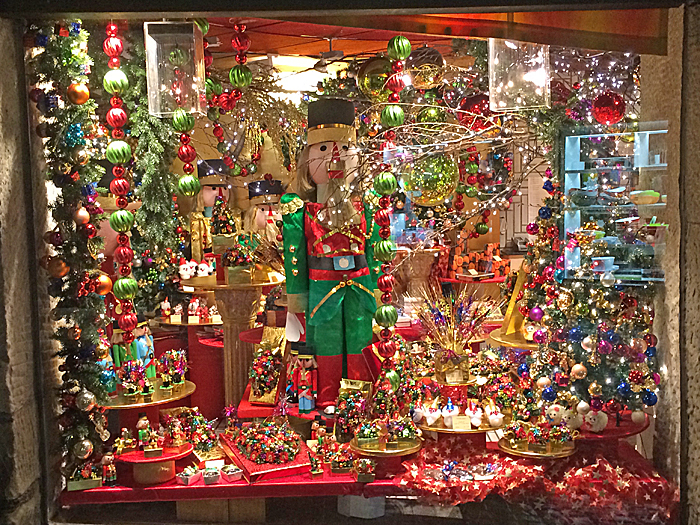 The image above is of a shop window in Salzburg, December 2014. Ruskin, John. 1956. The Seven Lamps of Architecture. London: Everyman’s Library. First published in 1849.